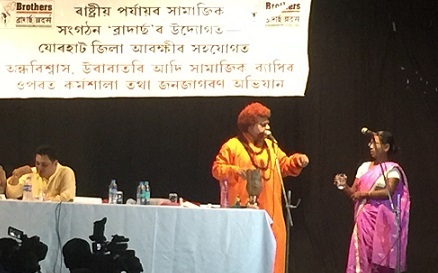 Bedecked in the saffron robes of a Sanyasin, Shahaji Bhosale from Maharashtra performed some common tricks which turned a con man into a god-man at the packed district library auditorium at Jorhat on Friday. Shahaji Bhosale, Chief Secretary of Maharashtra Andhashraddha Nirmoolan Samiti (MANS) or Maharashtra blind faith eradication committee is on a campaign to eradicate superstitious beliefs and social evils in different districts of Assam on the invitation of Dibyajyoti Saikia, founder of Brothers, an organization based in Assam which fights for human rights. The village elders, Village Defence Party (VDP) members, police personnel and others gathered at the venue and looked on in astonishment as he caused an empty coconut shell to smoke by throwing water into it, produced a gold chain from thin air, lit a lamp filled with water, poured unending water from a jar, carried a flame on the tip of his tongue, moved a flame over the skin of his hands, filled an empty bottle with the milk which he had drunk a moment ago and more. After the performance, Bhosale took off the disguise and revealed how these tricks were performed by so-called the god-man to fool the gullible and garner a following. The audience was told how sodium metal smoked and burnt when water was thrown into it, the sodium piece he had hidden in the coconut shell beforehand and how he had slipped a piece of calcium carbide, into what people from among the audience had tasted to be plain water and then poured into the lamp. When the calcium carbide mixed with the water it could be lit. How his saccharine coated finger, saccharine is 500 times sweeter than sugar, was dipped into the glass of water, which a woman from among the audience had first tasted and found to be plain water but had later tasted sweet, how camphor always burned with an upward flame whichever way one placed it and with a little practice one could put the burning bit on the tip of the tongue, and so on and so forth dispelling all the ignorance and beliefs of miracles from the minds of those who had watched with awe, his conjuring act a while ago. 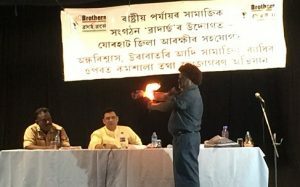 Saikia, who recently had toured most parts of Upper Assam and few other districts in middle and lower Assam to create awareness on crimes against women, said that this campaign had been organised centrally here and village leaders were invited to be part of the campaign against superstitious beliefs. Saikia said that apart from misuse of social media, the Internet, etc., two other things which were of importance were education and the uninvolved entry of the common man. “Unfortunately the education system in India has more to do with marks and certificates so that the candidate can get a good job. But education does neither teach a child life skills nor does it mould the character. As a result we have adults with half baked knowledge who cannot perceive between right and wrong nor differentiate between what to believe and what not to, and this needs to be changed,” he said. Saikia said that a person, who for various reasons did not want to get involved even when being an eyewitness to a wrongdoing or crime was as much to blame as those who were committing the crime. “Had this person not behaved in this callous manner, he could have prevented or taken steps to prevent the wrongdoing happening in front of his eyes. It was because majority of the people in today’s age had adopted an uncaring attitude that others got away with torture and lynching,” he further said. He also said that after this meeting was over the onus would lie on the people present here to spread the words and take preventive action as they were the village leaders and elders. Jorhat SP Vaibhav Nimbalkar, who also addressed the meeting, said that social media was like a two-edged sword, use it for knowledge and it is good, use it for spreading rumours and false information and it becomes a cause for fear, lynching and murders. Referring to the killing of two Assamese youths in Karbi Anglong recently, Nimbalkar said that those, who have been caught, confessed that they had spread messages about the presence of a child-lifter or ‘xopadhora’ which resulted in the lynching. Later these boys had repented at the fallout.